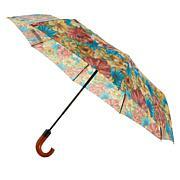 Brighten up rainy days and Mondays with Patricia Nash's signature map-print umbrella. Compact enough to stash in your handbag, but it opens to full-size coverage with the simple push of a button. 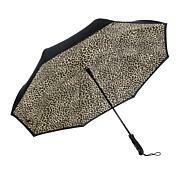 Finished with an embossed signature grape leaf logo on the solid, curved wooden handle for comfort and dreary-day style. 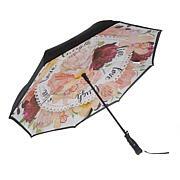 Gorgeous print, really nice size, beautiful wooden sturdy handle. Size compact to tote. High quality. 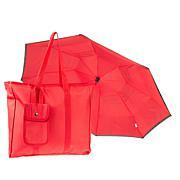 Love the umbrella and all of Patricia Nash bags, scarves and accessories. Always user friendly and functional. The convenience to just press a button and it opens so easy and of course LOVE PATRICIA NASH ALL her items !